ually filled with flowers, bushes, and trees. It has lots of curb appeal and people walking and driving by love to see it all year long. Your backyard is where the kids and dog romp and play, and you have lunch on the deck cooking on the grill. Changes in the lawn’s looks and needs do happen. Or a new lawn needs to be put in if you don’t use sod for a new house build. 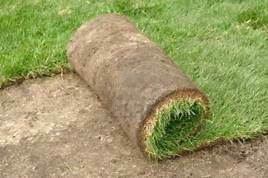 Grass seed is less expensive than the sod squares that has grass and roots already there. It usually comes rolled, you unroll it sit it on the soil, and water it in every day for a few weeks. Check with the supplier for full instructions. needs to be sown by hand to have straw or a net over it to keep the birds from eating your seeds and keep people from walking on it. Creeping grasses like bluegrass, Bermuda and most warm-season grasses spread by above- or below-ground runners called stolons. Creeping grasses are more inclined to have more thatch. Bunch grasses, for example Ryegrass and Fescue spread from the crown of the plant. 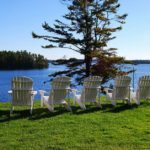 How large is your lawn area? Visit My Lawn Care at Scotts here. 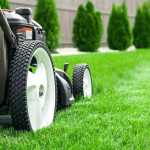 This will help you calculate your lawn size. What type of grass do you have now or what type do you want for your climate? The south does best with warm-season grasses while cool-season grass is best for the north. Be sure you know your growing season. Apply seed in the spring when grass starts coming out of dormancy usually around April in the north. In the fall, it’s a good plan to sow seed again for a lusher thicker lawn. Bouteloua dactyloides, known as Buffalograss or Buffalo Grass is a prairie grass in North America, also native to Canada and Mexico. It is short with fine leaves and spreads quickly with its stolons (underground runners). It has low water requirements because it’s native land gets limited water in the prairie in the west. It does not need to be mowed as often but does, however, green up later and goes dormant earlier in the fall. Having been hybridized it is now a major turf grass in the USA and its negative qualities have been genetically improved. This grass is becoming popular because of its low maintenance and beauty. Most other turf grasses are brought here then genetically engineered (selective breeding) and cross breeding to have the grasses we know today. Even with the many grass varieties, there are still only 2 types: Cool- or warm-season. There are some transitional zone types where those grasses can be planted in cool- or warm-seasons. The climate for cool seasons are those places with warm and hot summers with cold winters, freezing temperatures, and even snow. These places have large amounts of rain so that the grass will not turn brown and go dormant. Dormant is not dead; the grass is preserving its energy for when the weather is wetter again. Annual Ryegrass— (Lolium multiflorum), is planted in the North because it tolerates cool weather. It does not go dormant when others do usually at the first frost. It usually stays green in the winter. Ryegrass is more resilient and mixes with Bluegrass; Ryegrass needs more sun than Bluegrass. Bentgrass— (Agrostis palustris) if you want a small golf course in your backyard. It is used forgolf courses in the North because it doesn’t mind short frequent mowing and it loves the cold. 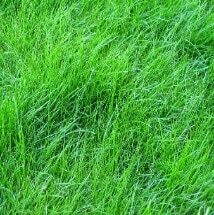 It grows sideways and should be kept 90-degrees to your regular grass because it will grow there too. This Bentgrass is known as Creeping Bentgrass. Fine Fescue— (Festuca filiformis) requires less maintenance, will tolerate light shade, and is resistant to bugs. It is upright, dense, and attractive. It doesn’t tolerate a lot of wear and walking on it nor a lot of heat. It is lovely under shade trees and perfect for dry conditions having deep roots. Mix with other varieties for an ideal lawn. 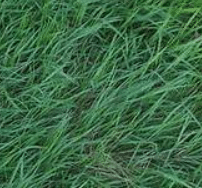 Kentucky Bluegrass— (Poa pratensis) is an excellent choice for flexibility to withstand temperature and moisture excesses but will go dormant if too much of either losing its bright color. Slow to germinate from seed. Will grow in light shade and full sun. Often planted with Ryegrass that needs more sunlight. Perennial Ryegrass— (Lolium perenne) can take a beating and is quick to establish. The texture is medium-course and grows in many climates. Undersides of leaves are smooth and shiny. It blends with Kentucky Bluegrass in colder climates and is more beautiful than Annual Ryegrass. Good for over-seeding existing grass. Red Creping Fescue— (Festuca rubra var. rubra) is very stable through droughts and tolerant to shade. Blend with other grasses for shady areas such as under large leafed trees. It has a fine texture to a dark green color. It creeps with its underground stolons to reproduce itself for dense thick patches. Rough Bluegrass— (Poa trivialis) has soft leaves, glossy on the back, and is yellowish-green. The tip is shaped like a boat hull and it spreads by stolons for dense and thick patches. The roots are shallow and will pull out easily. It is straight when it first germinates at first laying down to mat when it becomes older. 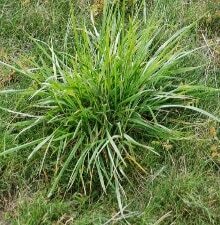 Tall Fescue— (Festuca arundinacea) needs frequent mowing growing fast and in patches being shade and drought resistant. It will survive high traffic. The blades are wide and pointed and grows very fast after a slight rain. It has a dense root system, good for the environment, and farmers plant for pasture and grazing of animals. Fescue and Ryegrass types are more hardy and tough and blend well with Bluegrass. Ryegrass needs lots of sun and Fescues are hardy but are in ugly unattractive clumps like at my house. All grasses respond well to weed eaters. 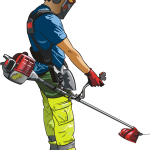 See Pros and Cons of Weedeaters for more information here. Warm Season Grass is a term given to various grass species that thrive best in summer temperatures between 80- and 95-degrees. The main range of acclimatization are the southern and western regions of the USA including the transition zone. Growing a great and handsome lawn in the South is more complex than in the North. Turf choices are more problematic so many people go with plugs or sod rather than using seed. 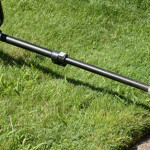 Good soil is important to have a green gorgeous lawn without a lot of maintenance. Most of the warm-season types of grass seed will turn brown when the weather becomes cooler. 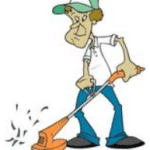 You can do what is called ‘winter over seeding’ spreading the seed over the existing lawn using Ryegrass each fall. This will preserve the green color over the cooler winter months. Without ideal growing conditions and your grass seed of choice, you can have St. Augustine or Bermuda coming up all over. Bahiagrass— (Paspalum notatum) is good if your soil is sandy or acidic. It defies drought and is super tough for wear. Pets won’t kill it but it is a challenge to mow due to being so coarse. It’s a fast-growing grass and requires more mowing because it grows so fast. It is a striking green color. Bermuda Grass— (Cynodon dactylon) tolerates cold and drought and is disease resistant spreading quite fast. 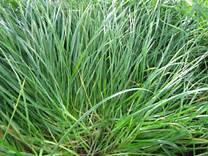 It grows in any type of soil and flourishes being the most favorite grass grown in the South. The downside to growing this grass is that it doesn’t do well in shade as do other warm-season grasses. Would look nice under big shade trees. Buffalo Grass— (Buchloe dactyloides) is a slow growing grass, drought, and heat tolerant, shade intolerant, and doesn’t care for sandy soil. It just might be our only true turf grass in the USA native from Montana to New Mexico. It reproduces by stolons and its own seeds. It forms a fine textured relatively thin turf with a soft blue-green color. St. Augustine Grass— (Stenotaphrum secundatum) is tough, roots grow deep, and the grass grows fast, tolerating salt and shade. Grows well along coastal regions but is vulnerable to disease growing thick thatch when over fertilized and over watered. St. Augustine grass is the turf of choice in the deep South. Zoysia Grass— (Zoysia tenuifolia) is tough, beautiful, wear and drought resistant and takes many years to establish. It requires lots of fertilizer and is high maintenance needing little mowing. It does not grow tall with seed heads but spreads by stolons in many sideways directions rather that up straight. The right grass for your region is all about your climate and your way of life. on varieties. The transition area is capable of growing both types with the proper care. 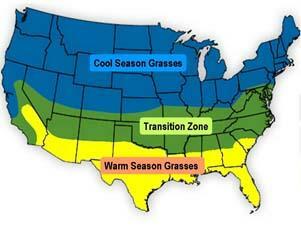 Read more about grasses for your turf here with the transition map showing cool- and warm-season areas shown by Scott. 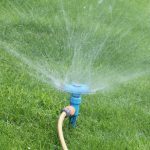 It’s a good idea to shop an online grass center or your local garden nurseries for seeing the best lawn grasses and talking to an expert. Happy Shopping!